Clark County is a US county in Indiana, located directly across the Ohio River from Louisville, Kentucky. The town of Charlestown, in that county, is 591 feet high, and was the first Masonic capital of Indiana. 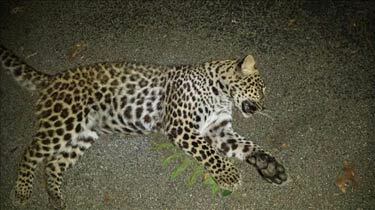 Just outside town, near a home on State Road 3, was found the bullet-riddled carcass of a leopard. No one has explained what the leopard was seeking in such a fly-over location. Two Indiana residents got the surprise of their lives Thursday night when the “bobcat” they shot turned out to be something quite different. Indiana wildlife officials say it was a leopard. On Friday morning, WDRB News was contacted by Donna Duke, a Kentuckiana resident who claimed to have photographs of a leopard that was shot at a home on State Road 3, just outside of Charlestown in Clark County, Ind. Duke spoke with WDRB News by phone. She says her friend — who wishes to remain anonymous and did not want to speak with the media — lives in that area, which had seen a number of attacks against dogs and cats recently. Duke’s friend has a number of cats, and was worried about their safety. “She’s got cats that are basically her family,” Duke said. Duke says her friend contacted a local wildlife official, who initially thought the attacks might have been committed by a bobcat. He told her to keep a sharp eye out for bobcats at night. Duke says her friend told her that she and her boyfriend took turns watching the area from the roof every night. “She was trying to protect her babies,” Duke said. Sometime late Thursday night or early Friday morning, Duke says her friend was outside near her pool, when she saw a dark shadow pacing back and forth nearby. That’s when, Duke says, her friend’s boyfriend grabbed a gun and shot it. Duke says her friend heard a “horrible squeal” and they ran to see what it was. “But it was not a bobcat,” Duke said. Magna Carta, 4th Amendment both dismissed by Indiana Supreme Court. Orrin Kerr discusses this atrocious ruling at Volokh Cospiracy. Orrin Hatch on democrats: “They play politics very, very tough, they play it well, and they don’t give a damn about what’s right and what’s wrong.” That is the essential truth about liberal pols in a nutshell. Garden gnome drowns 58-year-old woman. New Russian all-female sect, centered near Nizhny Novgorod, venerates Vladimir Putin as reincanation of St. Paul. Hotline OnCall admires a very nice thank you gift recently delivered for services rendered during last year’s primary campaign for the democrat party presidential nomination. It’s not often that a plum ambassadorship goes to someone who isn’t a career foreign service officer or a big bucks campaign contributor, but Pres. Obama has nominated Anne Slaughter Andrew to be the ambassador to the Republic of Costa Rica. But Andrew is also wife of ex-IN Dem chair Joe Andrew, who was tapped by Bill Clinton to be DNC from ’99 to ’01 who also was a big backer of then-Sen. Hillary Clinton in her ’08 bid — until five days before the must-win IN Dem primary last year, when Andrew with great fan-fare threw Clinton under the bus, endorsed Obama, urged all his fellow Hoosiers to vote for Obama and called up party leaders and fellow superdelegates (Andrew had that status to the Dem convo because he was an ex-DNC chair) to basically shut the nominating contest down after the IN primary and get behind Obama. Geee, somehow he managed to survive and somehow the current Sec/State must have an amazing amount of equanimity and grace not to have choked on this administration nomination. A small white kitten climbed up sales representative Steve Johnson’s tire while he was stopped at a Piggly Wiggly in Evansville, Indiana. The stowaway rode more than 1400 miles in the engine compartment in the course of a week, until Johnson stopped for an oil change in Madison, Wisconsin and his passenger, a little dehydrated, but otherwise none the worse for wear, was discovered. The NRA’s Armed Citizen column in American Rifleman has for many years published accounts of successful cases of self defense with firearms. But how often do you read a story of someone defending his home with a samurai sword? Muncie man is in jail with samurai sword injuries after allegedly breaking into another man’s home to get his wife back. Joseph M. Hartman, 28, and his friends Bobby Joe Overbay, 18, and Matthew Michail Wilson, 23, all from Muncie, broke into the home of Jessy Mann, 26, 1910 S. May Ave., early Saturday morning to “take Hartman’s estranged wife by force,” according to the Muncie Police Department. The three men knocked at the door and refused to leave when Mann asked them to do so. Then they entered the home and began throwing objects at him, including an alarm clock and furniture. Mann grabbed a collectible sword to defend himself and swung at the three men, hitting Hartman in the head and chest and Overbay in the forehead. At one point, Mann said Hartman found his wife, from whom he is separated, in the bedroom calling the police, and he grabbed her by the hair. “They were saying ‘Just let us take her, just let us take her.’ I was like ‘You ain’t taking nobody from my house,” Mann said. Hartman and his friends left the home without his wife. Before fleeing, they got into a Jeep Cherokee and ran into the house three times and then drove away. Mann said he never intended to use the sword as a weapon and he was glad no one was killed. Police in Indiana think an injured man who was found in a cemetery over the weekend might be guilty of vandalism. He was found amid 14 damaged headstones — including a thousand-pound stone that had tumbled over and pinned the young man to the ground. Police say the 22-year-old was found unconscious, with both legs broken. They say it took five officers to lift the headstone. The impact left the letter “V” imprinted on Michael Schreiber’s thigh. Police say the “V” stood for the name on the family tombstone. Schreiber will face charges of criminal trespassing, criminal mischief and public intoxication. He may also be ordered to pay for damage to 14 headstones. the Archives of Never Yet Melted in the 'Indiana' Category.